Gopaka (Skt. ; Tib. སྦེད་བྱེད་པ་, Bé Chépa; Wyl. sbed byed pa) aka Jivaka (Skt. Jīvaka) — one of the Sixteen Arhats. From birth his body was covered with ulcers and sores and he was in constant pain. His parents spared no expense to find a cure for him, but to no avail. One day he went to Jeta Grove, saw the Buddha teaching and bowed to him in wonder. Seeing his condition the Buddha explained the impermanence of all existence. Realizing the implications of this teaching he followed the life of a bhikshu, became ordained and attained realization. He realized his condition was due to causing another great pain in a previous life. He lives in a cave on Mt. Bihula with 1,400 arhats. 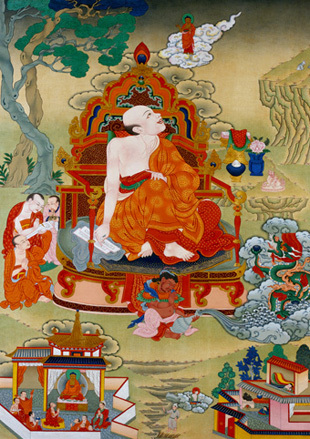 Gopaka holds a book showing his dedication to the teachings and his resolve to help others; his blessing endows practitioners with knowledge of the arts and sciences, and imparts discriminating awareness, enabling them to teach the Dharma. This page was last edited on 12 December 2016, at 13:17.